WE KNOW YOUR TIME IS LIMITED & VALUABLE. We have an extensive baby and toddler section in our stores to help you find everything you need to care for your little ones. We are proud to offer the convenience of finding a large selection of your baby essentials while you are grocery shopping for your family. Once you have signed up for our Reach Offers E-coupon program, you will earn points every time you purchase baby related items. Each Monday you will receive an email with the new e-coupons available for clipping. At the top of the email will be your rewards balance for baby and pet items. 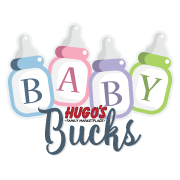 When you reach $150 in baby or pet items, a reward will be emailed to you from Hugo’s Family Marketplace. Note: It can take up to 24 hours and is emailed only on business days. Once you receive your reward email, open the email and “clip” the Baby Bucks reward to add it to your virtual wallet. (Note: if you have a gmail account, the email will be found in your “promotions” folder). You can use your reward on your next shopping trip at Hugo’s by entering your phone number at the checkout lane.